Please Note: Supplied are standard not finned as pictured. Swapped these in for some Sram brakes that came stock on my bike because these are no effort at all to bleed, and no need to worry about getting Dot fluid over the place. They arrived promptly, well packaged, and with an extra barb and olive to trim the length of the hoses, making them a really quick and easy fit. After a few weeks of use they are proving to be a solid brake. Reliable bite and good power; they're not as powerful as the big hitting brakes of this world, but I've no qualms that they are more than sufficient for the usual lakeland descents and laps of Innerliethen that I ride. For the price, they're stellar. I would say in the performance:value analysis these are the best you can get anywhere. Great stopping power, nice fit and feel and look good also. I don't see why anyone should consider anything else. Excellent pricing from Merlin also. Exactly as advertised. Easy to install and hoses were plenty long to fit my size large hardtail. Great brakes. Now, I wouldn't say I have tried that many different sets of brakes but of the lot these are the best, everything is just right in terms of looks and performance, I won't pretend that I know how to describe modulation etc but they do the job and do it very well! Excellent service. Brakes superb, good modulation even under hard braking. Usual Shimano quality. Ready to go out of the box. Fabulous stoppers. Got these on a tandem with 7 and 8" Icetech rotors, quiet, no overheating and false teeth losing power! Very fast and efficient delivery especially as it was overseas. Easy to fit and worked a treat first time. First used on a 13km decent with no fade or variation in the bite point. Fabulous, 1 finger braking in the wet, big improvement compared to my v-brakes on the other bike. Very good brakes, easy set up, fast delivery from Merlin. Super set of brakes. Replaced the Avid Elixirs that had become very draggy despite being properly bled. Shimano's choice to use mineral oil instead of dot 4 brake fluid means they need bleeding much less frequently and are less prone to piston seizure. I had to cut down the hoses as they were way to long for my bike, but that was easy to do with the spare olives and inserts supplied in the box. Brake levers are easily adjustable for reach and the brakes are very powerful and well modulated. Price from Merlin was much better than any other seller! Many sellers asking the same for one brake as Merlin were charging for the set! Much better feeling compared to my Formula Rx! You should note that it's a UK version, I had to switch levers. 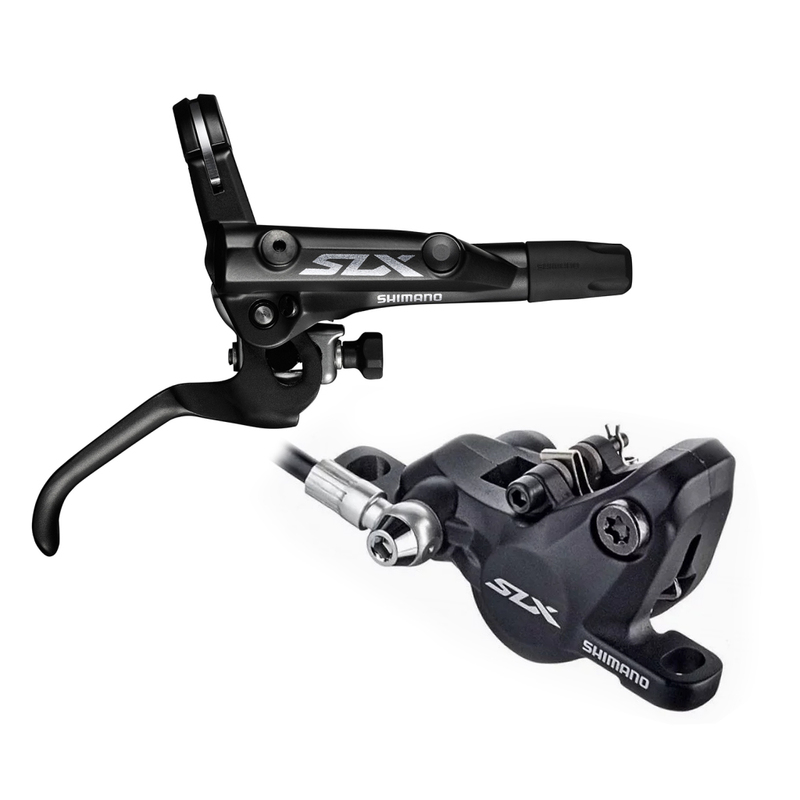 Based on two rides over a week, these offer good, powerful braking at a reasonable price, as you`d expect from Shimano, with better modulation than previous SLX brakes. Great brakes, easy to fit and setup and a bargain price the boot! The price was brilliant but the factory bleed was a joke as both brakes needed bleeding and quite a bit of brake fluid to work as they should. They pull up really well but the bite point is much closer to the bars and will take some getting used to after having had Deore brakes which didn't have much free stroke before sort of working. I Bought for mainly XC. But this brakeset should be adequate for all but serious downhill bikes. They look good too. Very capable brake with plenty of stopping power at a fraction of the cost of other brands. Excellent. Almost gone over the handlebars a few times. Need to work out how to adjust slack on levers though information is limited.